Aaron James “A. 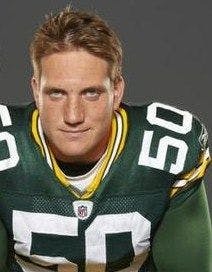 J.” Hawk ,born January 6, 1984, is an American football linebacker for the Super Bowl Champions, Green Bay Packers. He was drafted by the Green Bay Packers fifth overall in the 2006 NFL Draft. He played college football at Ohio State. I have always used nutrition and supplements to help maximize my potential. I use all of the Onnit natural products and feel as good as I have ever felt. Total Human Optimization Podcast #33 With AJ Hawk _May 6, 2014 With the draft just around the corner, we talk with pro linebacker AJ Hawk about what its like entering and preparing for the big leagues. Before every workout I make sure to take my Shroom TECH Sport. It gives me the endless energy and stamina that last long after I'm done. I will not leave home without it. Total Primate Care is the easiest way to make sure I get all my “go to” Onnit supplements when I'm on the go or traveling. They supply the most important products in an easy bundled package without much effort or thought. I can grab it quickly on the way out of the house. Not only does the Onnit formulation of Melatonin taste great in the chewable tablets, but it actually works great when coupled with New Mood. I usually wake up before my alarm ready to go! This is another supplement I believe helps with my digestion and overall well being. It feels good to take some of these throughout the day to ease your stomach and make you feel as of you did get enough greens on days when whole foods weren't available.